Max Lucado's charming and affirming book for children is a heart-warming tale of God's love, and his faithfulness. 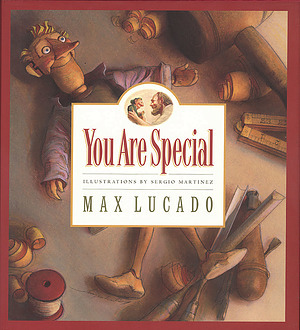 You Are Special is a heart-warming children's tale from best-selling author Max Lucado. Every day the small wooden people called Wemmicks do the same thing: stick either gold stars or grey dots on one another. The most talented and pretty Wemmicks always get the stars, and those who can do little or who have chipped paint, receive ugly grey dots, just like Punchinello. But Eli the woodcarver helps Punchinello understand just how special he is, no matter what all the other Wemmicks may think. In You Are Special, Max Lucado conveys a vital message for children everywhere: that they are special in God's eyes. Max Lucado is one of Christianity's bestselling authors for both children and adults. He is the proud father of three girls, and senior minister of Oak Hills Church of Christ in San Antonio, Texas. Sergio Martines was born in Mexico City, studied art in Paris, and has worked as an art director and illustrator on three continents. He has done freelance illustrative work for Disney Press and other major publishers, and has illustrated internationally renowned gift editions of several literary classics including 'Peter Pan', 'Pinocchio', and 'A Christmas Carol'. You Are Special by Max Lucado was published by Lion Hudson in September 2004 and is our 1386th best seller. The ISBN for You Are Special is 9781859855423. Amazing - for adults too! Never mind the children (they will LOVE this book) but this is also perfect for anybody who needs a boost and a reminder of God's amazing love for them. A perfect reminder of how special we are in God's eyes, regardless of what the world might think. Got a question? No problem! Just click here to ask us about You Are Special. Every day the small wooden people called Wemmicks do the same thing: stick gold stars or grey dots on one another. In this children's tale, Eli the woodcarver helps Punchinello understand how special he is - no matter what other Wemmicks may think. It's a vital message for children everywhere: that they are all special in God's eyes.